GILLES CAFFIER’s pieces are creatively chaotic, a reflection of soft extravagance which is exceedingly rare. He is passionate yet discreet. he understands that to be free artistically is nothing, but to be free and remain free is the most difficult. This is the ultimate luxury. GILLES CAFFIER creations are humanistic. They are born from the hand and nature, without rejecting technology. Created out of a common interpretation of our world. Each piece is the result of meticulous work, and a unique mixing of knowhow and permanent questioning. A large part of his collection are limited editions. Couture. Born in France, he studied textile and fashion design there. He started his textile career in the Parisian couture, Yves Saint Laurent and Paco Rabanne were among his clients. He moves to Tokyo at 22 and becomes an international fashion school art director. A few years later he opens his design studio. In 1993, he begins to concentrates his energies on interior design and decoration. He also starts producing his own work. Since then he has created an lab of 50 artisans in divergent fields that are continually working, evaluating, collaborating and experimenting. Gilles creates and produces a collection of furniture, lighting, and accessories for design and lifestyle boutiques. In 1996 his first collection is featured at Joseph in London. He attracts the attention of design and interior visionaries as well as the international press. His clientele share the same demands: creativity and authenticity. Living abroad since he was 22, has given GILLES CAFFIER a unique international vision. His first clients came from the fashion industry such as Brown’s in London, Corso Como in Milan. Florist are admirers as well, seeing a connection between the natural elements they use and his elaborate textures. They are inspired by mixing his materials, wood, marble, leather, hematite, pierced earthenware, with their favorite floral elements. They use his votives as planters, his vases to show their talent. Trend in Geneva, Vertumne in Paris, and TEA ROSE in Milan utilize a variety of Gilles’s objects in their work. Recently, GILLES CAFFIER has turned his attention to interior design and renovation projects. He is available for consultation as creative director for such projects. Gilles production facility allows him the ability to design and create site-specific pieces only also. He listens to the client, studies their needs and the space, then provides guidance on options, overall concept orientations. Comfort comes from the technical functions, quality materials. “Couture” is born of the perfection of details and finishing, and the rarity of materials. “Culture” points to the overall concept of the project and the specifically created elements. Furniture, lighting, textile and objects complete the project. 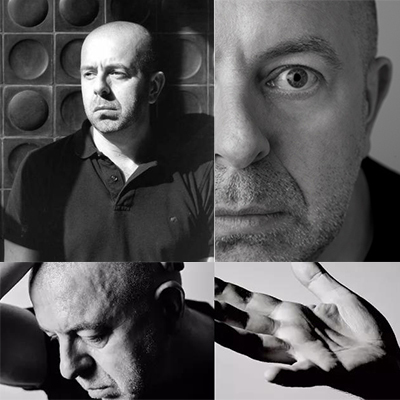 GILLES CAFFIER has the unique combination of creative vision and production capabilities to put his “couture” stamp on any project. His international life and extensive travel give him the luxury to remain open, to all aspects of design and the decorative arts. His memory of eras, cultures, line, texture, color, and light make all his proposals unique, yet always remain in the context of: comfort, couture, culture.